Day 8 Challenge is to read a book about accessibility. Inclusive Design Patterns by Heydon Pickering. The book is very easy to read and understand. It is built around the things you wish to create, instead of the checklist of how you would test them. Also it has a stunning design. Design for Real Life by Eric Meyer & Sara Wachter-Boettcher. I actually didn’t read this book yet. I’m just sharing the recommendation of Adrian Roselli. Free Accessibility Books – This is a list of a some free books about accessibility. Note that it’s a bit old, but I guess some basics are probably still relevant. You can check it out yourselves and let me know if you found anything that you like. 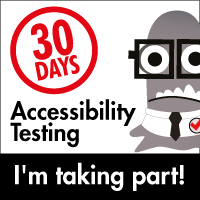 Thanks to Dennis De Booij for sharing this link as part of the #30DaysOfTesting. Next PostNext Day 7 – Don’t Touch That Mouse!